We came across this 1933 advertisement for 76 Gasoline from the Union Oil Company of Canada. Apart from being a very good example of 1930’s Art Deco advertising, this advertisement shows how constant and standardized gasoline advertising has remained over the years. 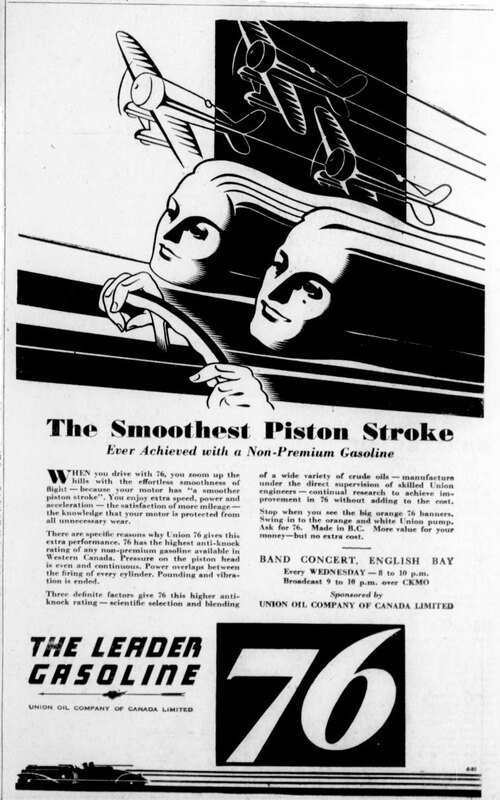 Note this advertisement’s emphasis on “smoothness” of acceleration, fuel economy (mileage), “scientific selection and blending” and “continual research to achieve improvement in 76 without adding to the cost”. None of these statements would be out of place in 21st century gasoline advertising. Another interesting historical note is the reference to the Union Oil Company of Canada sponsoring Band Concerts from English Bay in Vancouver on CKMO Radio. The CKMO call sign is still active but it is no longer used by a Vancouver radio station, as it was in 1933. The CKMO radio station ceased operations in Vancouver in 1955. the CKMO call sign was used by Camosun College in Victoria between 1993 and 2012, when Camosun College switched to Internet streaming instead of radio. CKMO-FM is now used by a radio station in Orangeville, Ontario.